Hi everyone, Steph Ackerman here today with Thanksgiving pumpkin décor. Anyone can be an expert Bow maker with the Bowdabra. Steph uses a pallet and finishes with a gorgeous Bowdabra Bow. With Fall officially here, it’s time to create Fall decorations. Use the Bowdabra to create amazing bows for Thanksgiving pumpkin décor and all your projects. I painted a Clear Scraps pumpkin panel and allowed it to dry before adding a Bowdara bow. 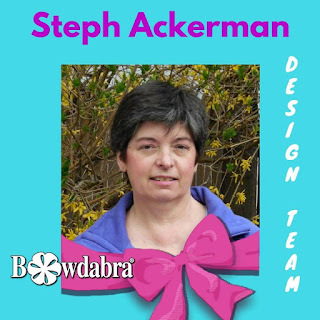 Start by placing a 10″ strip of 1/2 ” wide sheer ribbon in the Bowdabra. Add the bow wire. Using coordinating 2″ sheer ribbon, leave a 2″ tail and create a 3 looped bow, twisting the ribbon on each turn. Once all the loops are created, pull up on the bow wire and tie off. Fluff up the bow. Use a craft tool to create spirals of the remaining bow wire. Using the 1/2″ sheer ribbon, tie the bow to the pumpkin. Add some decorative fall colored ornaments around the bow to finish. This is a perfect Fall decoration for either inside or outside decorating this holiday season. If you enjoyed this amazing DIY from Bowdabra blog please visit us each week as we bring you new craft tutorials, videos, and more! And don’t forget to like us on Facebook and join us each week as Bowdabra creator, Sandy Sandler shows you how easy it is to become an expert bow maker! Every week one lucky viewer will win a special gift! See you there!